Amiee O’Loughlin from Ballina is a regular Bumbleance user and relies totally on this vital service for her multiple trips to Dublin. A fundraising social dance in aid of Bumbleance — the children's ambulance service — will take place in the Great National Hotel in Ballina on Sunday, April 15. 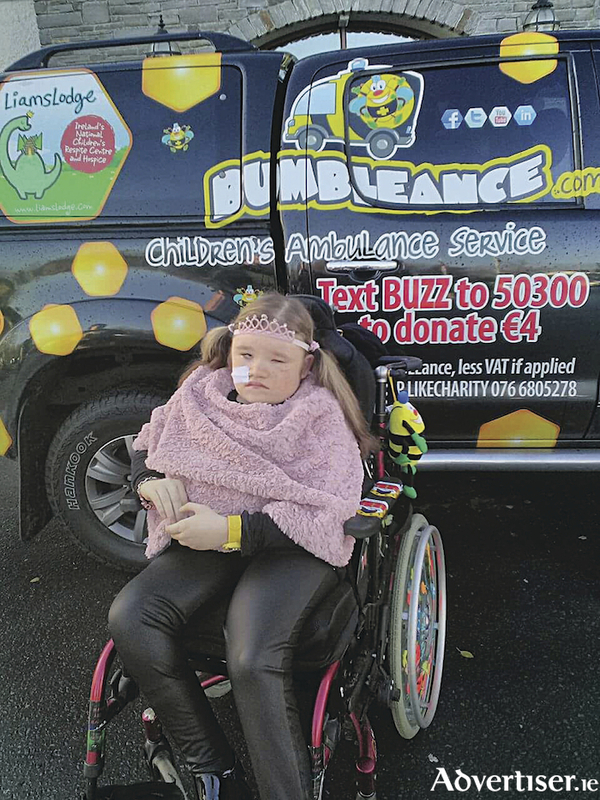 Amiee O’Loughlin from Ballina is a regular Bumbleance user and relies totally on this vital service for her multiple trips to hospitals in Dublin. Amiee is one of the many children from the northwest who use the Bumbleance service. Bumbleance provides a local and national service for critically ill children who need transportation to and from their home to paediatric hospitals and hospices, and it also provides angel trips for sick children. The service provides a high standard of professional medical care and a top of the range entertainment facility, and the aim is to distract, comfort, and ensure the smoothest and safest journey possible for Ireland’s sickest children. Doors will open at 7pm on the night with the dancing getting under way at 8pm, taking to the stage for this worthy cause are a number of top class musicians including Declan Nerney and special guests, Kelly's Heros, Band of Brass, Ciara's Danceblast, Stephen Gallagher, and Pat's Country Roadshow. This event is being organised in conjunction with Ballina Men's Shed and tickets cost €15 and are available from The Great National Hotel Ballina on the door on the night, in Timpson's located in the Dunnes Stores shopping centre, or by contacting Ann on (087 ) 9055384 or Pat on (086 ) 3334124.